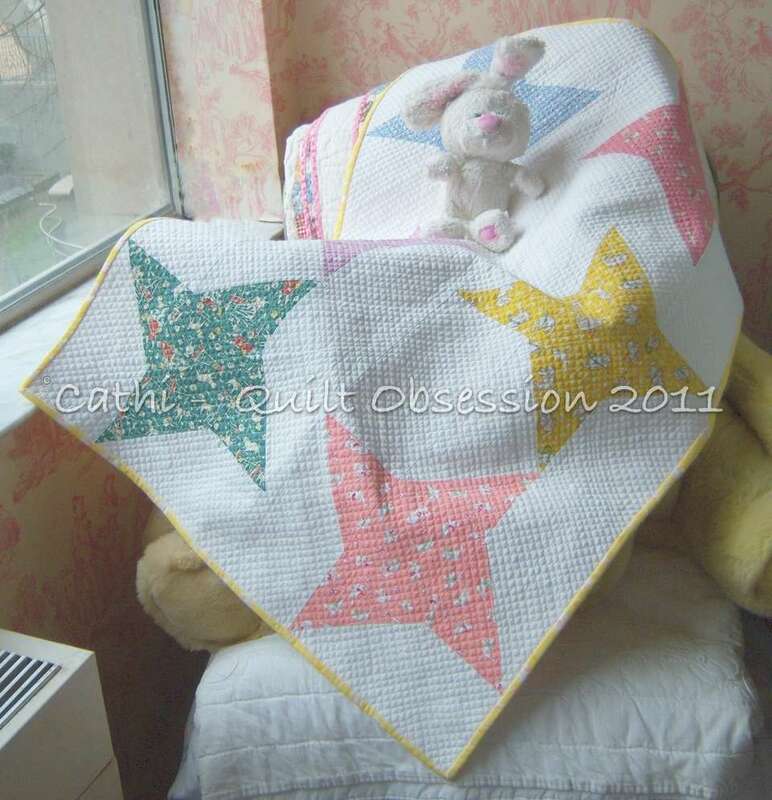 The baby quilt which I named Snuggly Stars, thanks to a suggestion from Karen Dianne, was finished Friday night. After cross-hatch quilting the two stitching books, I decided I’d cross-hatch quilt the baby quilt as well. I started quilting it around noon on Friday and by the time the evening was over, I had finished the quilting, put the binding on and tacked it down. All that was left was to add the label, which I did Saturday morning before I left to go to the Creativ Festival. The little quilt finished at 24 x 36 and was totally machine pieced and quilted. Sunday morning we threw it in the wash, which was a bit of an adventure. Mr. Q.O. took it up to the laundry room to put it in to wash and, when I went up to transfer it to the dryer, the machine had seemingly malfunctioned. Rather than draining the soap suds, it seemed to be making more and more. We think someone had put detergent in the machine previously and then not used it so that, when we used it, it had much more than recommended amount of detergent. When it finished the final spin, I couldn’t even see the little quilt for all the soap suds. I was holding my breath when I opened the door. As soon as I did, there was an avalanche of suds on the floor. I finally fished out the little quilt and put it in another washing machine with no soap to let it run through an entire cycle with just water as I figured that was the only way to get all the soap out of it. 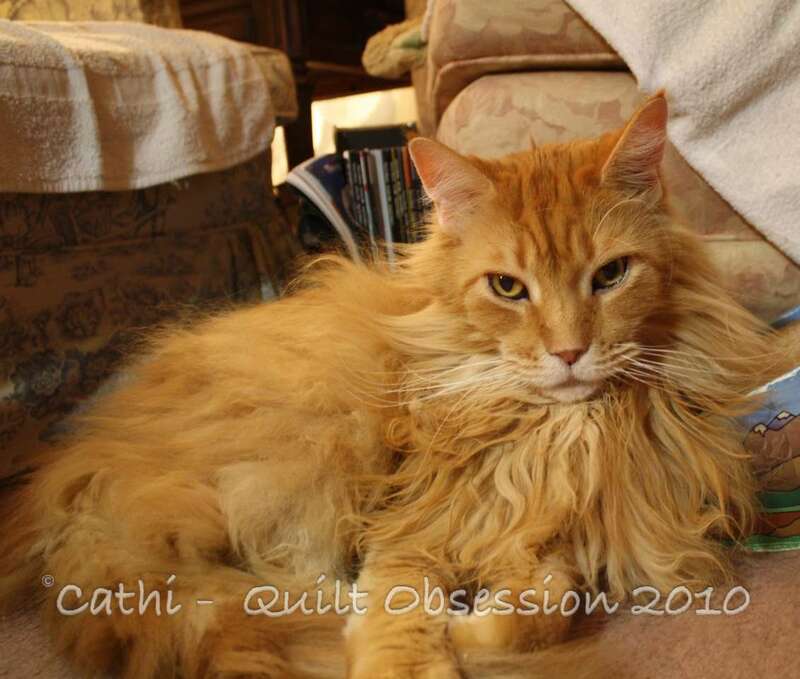 We made a decision on Friday that, as we don’t want to leave Smudge alone for too long, Mr. Q.O. would stay home on Saturday while I went to the Creativ Festival on Saturday and I’d stay home while he went to the baby shower on Sunday. By the time it finished its second run through a wash and then dried, there was just enough time to put it in the gift bag before Mr. Q.O. had to leave. Saturday the rain poured down for most of the day. Sunday we had snow. It didn’t stay on the ground, but there were a few times I looked out the window and couldn’t believe how heavily the snow was coming down. Smudge decided the best thing to do was have a snooze. Late last week, Mr. Q.O. informed me that we had been invited to a baby shower this coming Sunday. 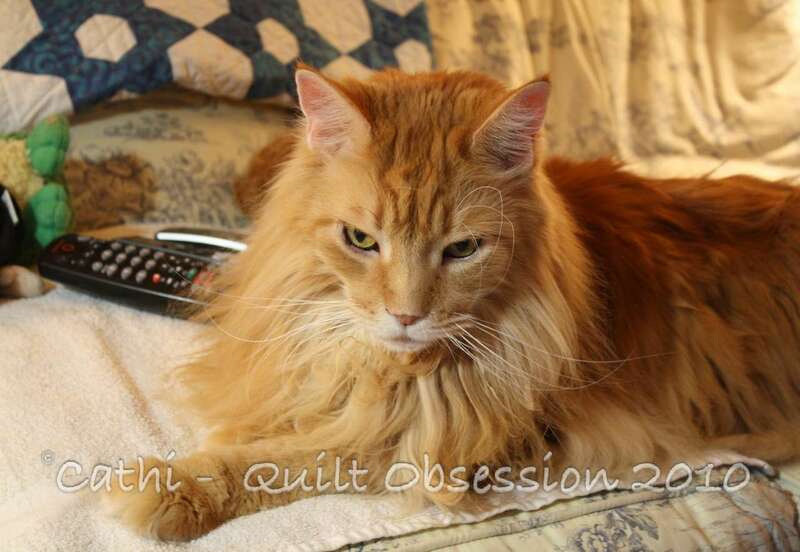 Of course, I immediately thought about making a quilt but in such a short time span? 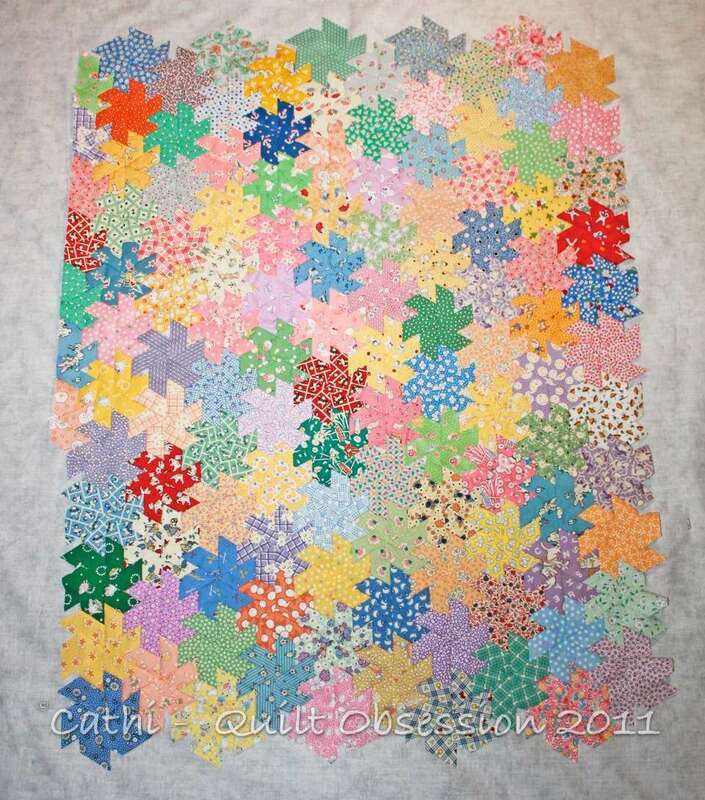 It obviously wasn’t going to be hand pieced or involve small blocks. 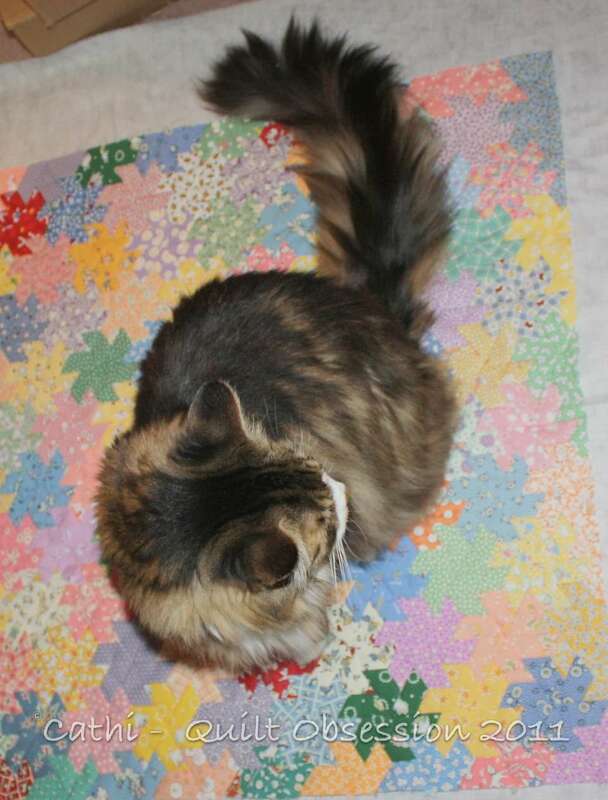 Only 4 of the blocks are visible as Smudge clearly is insistent on participating in showing quilt blocks if they’re on the floor. Out came the books as I searched for an idea. I finally settled on the 12″ star blocks shown. They’re even entirely machine pieced! 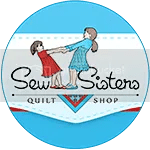 I used the 4″ HSTs and squares found in the 12″ Storm at Sea Inklingo collection collection as that way I knew I’d have no issues at all making the HSTs. Just print, stitch on the stitching lines, cut apart and they’re done. No cutting down to size, no dog ears, no paper to tear away. Just perfect HSTs each time. And, thanks to the stitching lines, I was able to consistently get a scant quarter-inch seam so that my blocks finish at 12″. 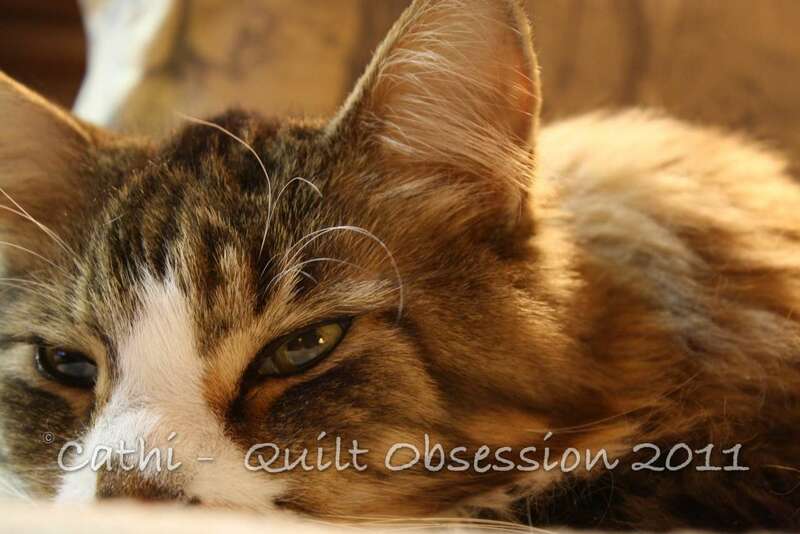 The little quilt will finish at 24 x 36 and will be machine quilted with 1″ cross-hatching. I’ll have it sewn together and basted and the binding made by tonight, will start the cross-hatching Wednesday and finish it Thursday, get the binding done on Friday, wash it on Saturday and it will be done in time for the baby shower on Sunday. Making this baby quilt has been a learning experience of me on a couple of fronts. One, that I can manage to machine piece accurate blocks. 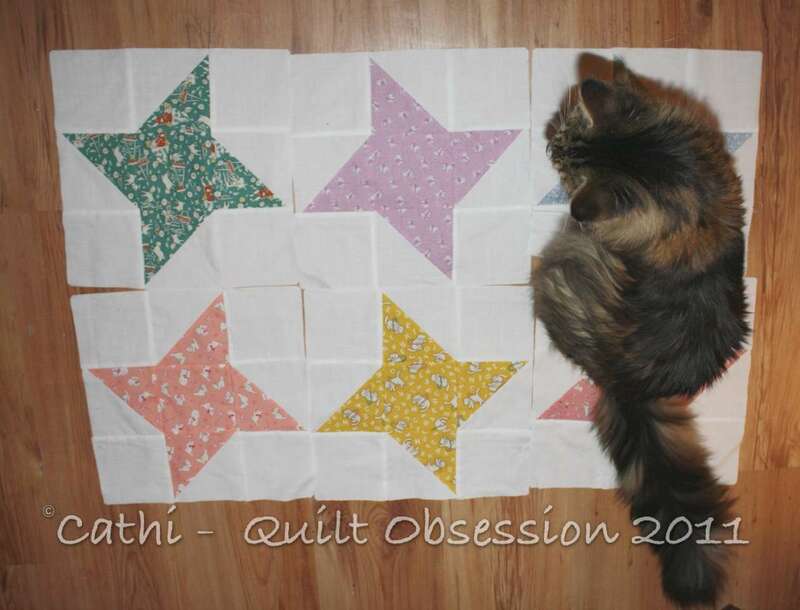 Second, and more importantly, that there really is nothing wrong with simple blocks for some quilts. I had to battle with myself about making the blocks because, as they are so large and involve so few pieces, somehow it felt like I wasn’t making something appropriate to give. 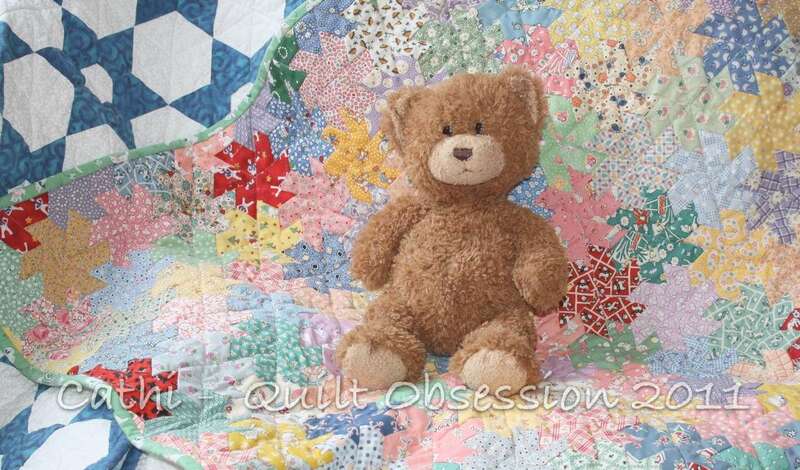 Then I thought about it, talked to a friend about it and realized that it was just fine for a baby quilt. Once this is done, however, I’m going right back to a Feathered Star or Sunflower block. 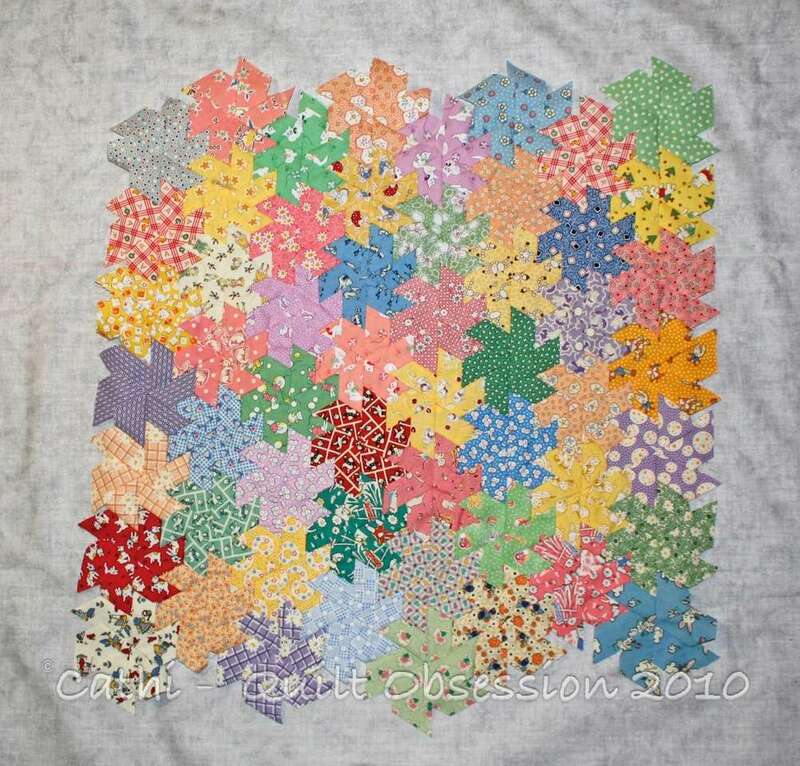 I need some hand piecing with small pieces to keep me happy. Smudge is clearly missing his brother, as are we. 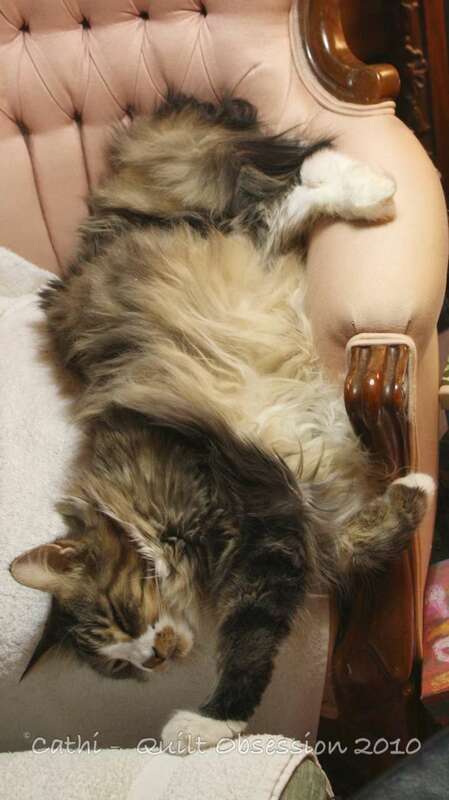 He has never been an only kitty, so I suppose this is a huge adjustment for him. For now, we’re trying to make sure one of us is home with him most of the time. Hopefully, he will adjust but, in the meantime, he’s making sure he can keep us within his sight. Yes, I know — a picture that’s almost identical to the one I showed yesterday. A healthy baby boy who has been named Cameron was born late yesterday afternoon, so this little quilt is now named Cameron’s Windmills, the label was completed and appliqued on and it’s ready to go. I’m not sure how much I’ll be posting this week. 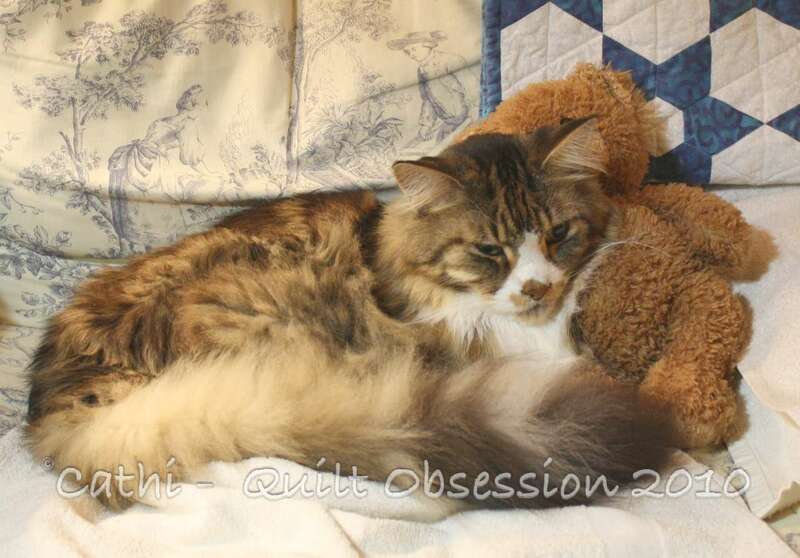 As well, visiting blogs and replying to comments will probably not be something I’ll be doing much of over the next few days as Lester has had another small stroke. 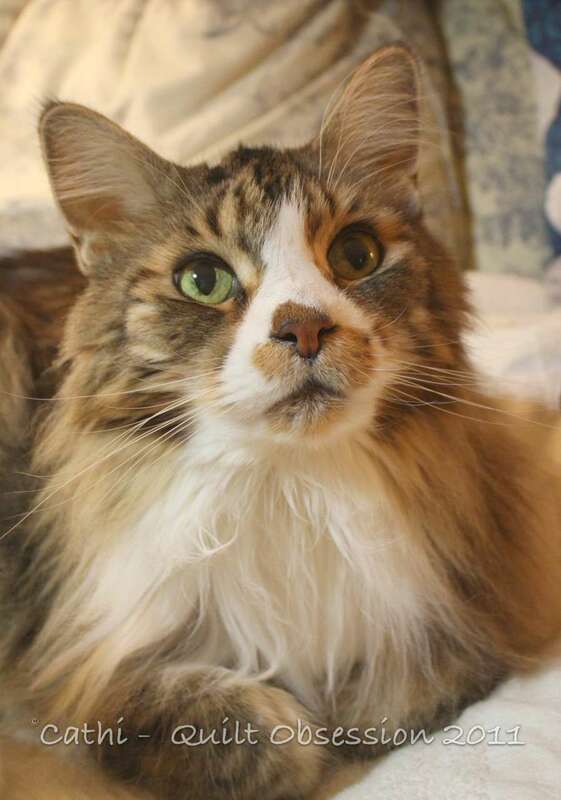 He’s had two strokes before now, both of which he recovered from quite remarkably well. This time? This time I’m not so sure what the outcome will be. When we left here to go to the vet’s on Monday, I wasn’t feeling very optimistic. However, the vets gave him a painkiller as well as an appetite stimulant. By the time I sat down to write this late Monday night, there was a very small improvement so we’re hoping that he can bounce back this time as well. For now, we’re syringe feeding him and Smudge. 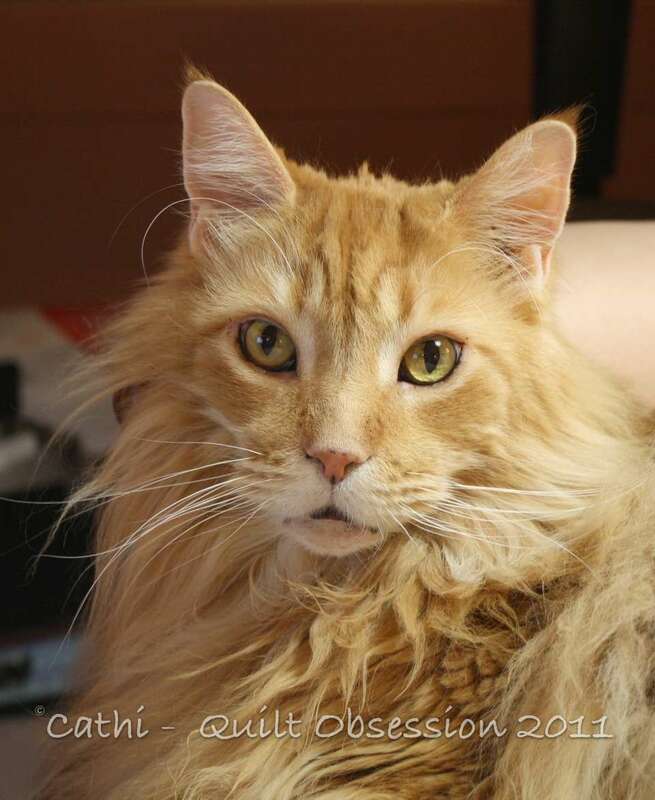 This picture of Lester was taken last week. He was much more restrained than Smudge — didn’t feel he had to get on the board when we were trying to take a picture of the Rainbow Flower. Smudge was checking on Lester throughout the evening on Monday. 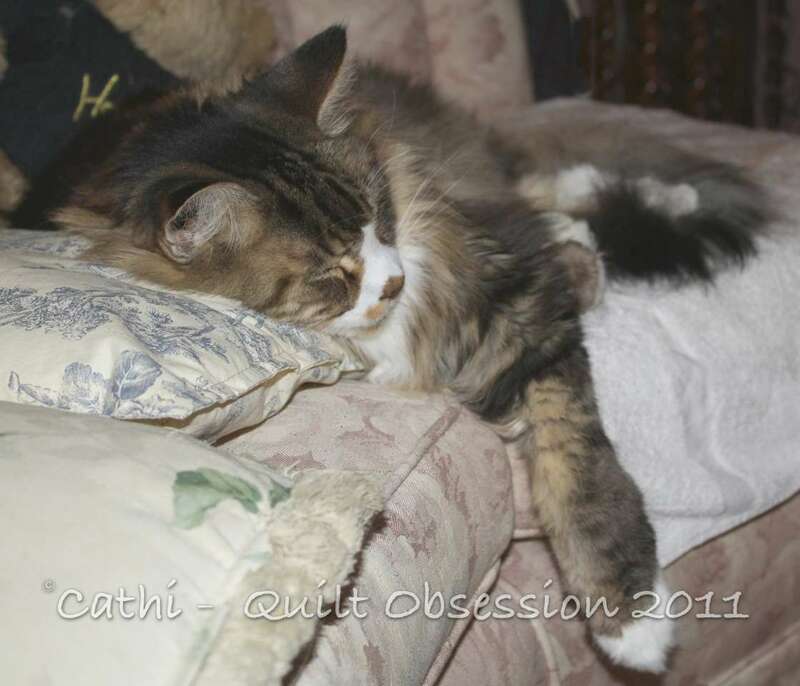 Then he stretched out for a snooze. It’s pressed and ready to baste. Hopefully that will happen this afternoon. It finished at 38 x 27. 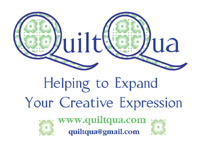 Names for quilts usually don’t present a problem for me but not this time. I cannot come up with a name I like at all. Maybe once I start quilting it something will come to me that works for it. Suggestions are more than welcome. We’re in the midst of doing some reorganizing and, as part of that reorganization, I’m hoping to free up an area in the apartment where I can use a wall as a design wall. 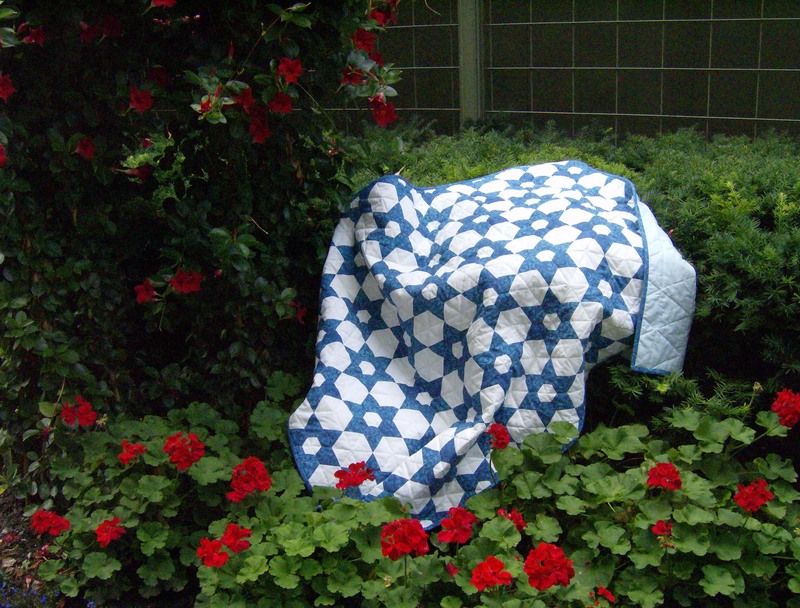 That would be great for photographing something like this little quilt. For today’s photo, we laid it out on the floor and Smudge had to immediately come to inspect. Monday I spent a bit of time trying to get more comfortable with EQ. Today I plan to spend more time. I am not finding it a very intuitive program at all, but hopefully it will become easier the more time I spend using it. We think that Smudge has turned a corner. He started eating a lot on his own on the weekend. And eating. And eating some more. That was a huge relief! The next step will be getting him off the kitty junk food and back on to some of the better foods. We also managed to find some foods that have no tuna in them that he likes. Here he was relaxing after one of his meals. This picture of Lester makes me laugh. 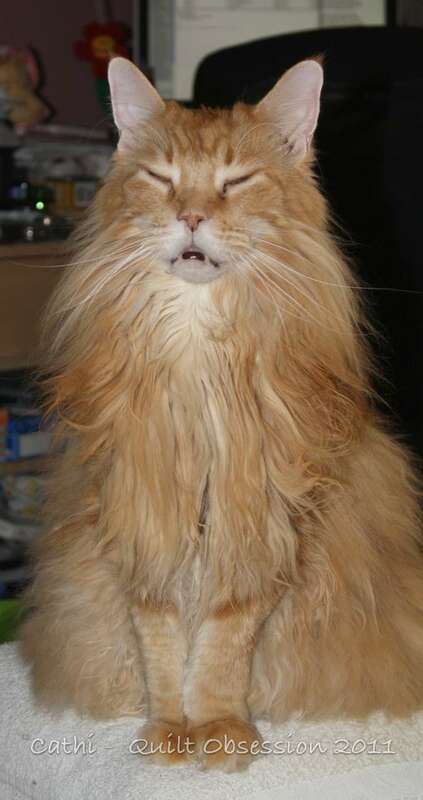 He looks like he’s sleeping sitting up. Another hour or two of stitching, and all the edge pieces will be attached and it will be time to press and baste the baby quilt. 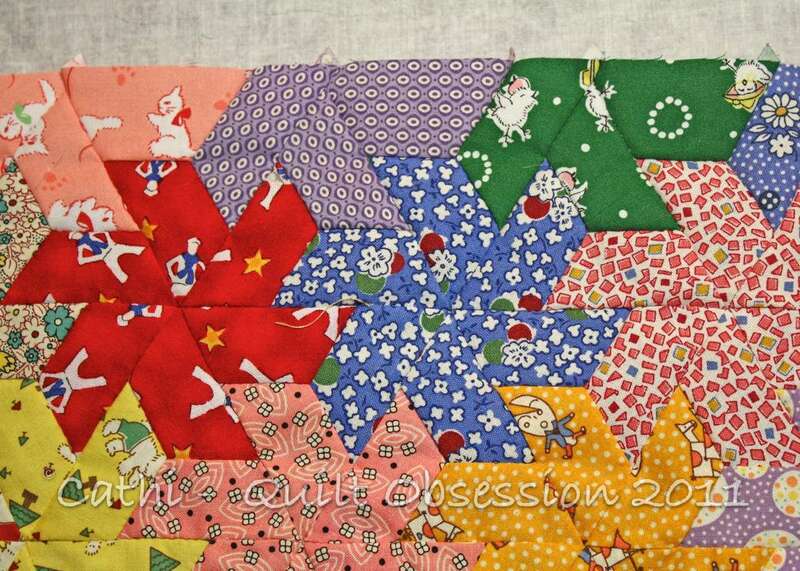 I’m thinking that a scrappy binding made up of ’30s prints will be what I choose for this. 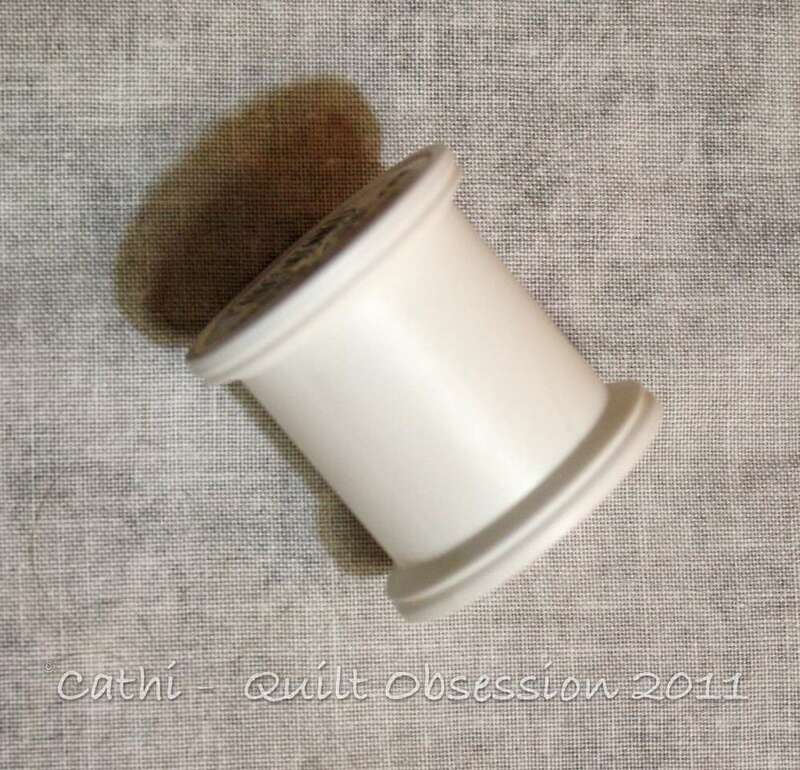 Because I normally match my thread colour to the pieces I’m stitching, to finish off a spool of thread isn’t something that happens frequently as a spool will last a very long time. Because of the scrappy nature of the baby quilt, I’ve been using a peachy pink heirloom cotton thread which seems to melt into the seams of every colour for piecing and on Wednesday night actually used the very last bit on the spool. I’ve not been doing well in responding to comments this week or in leaving comments. There’s no real good excuse for this other than I’ve been dealing with some news about changes in one company with which I work which has left me rather drained. I really do appreciate and read every comment and hope to get caught up on the replies and comments over the next day or two. Smudge was posing for the camera Wednesday. He has always been a camera ham but, for the past month or so, hasn’t been quite as interested. However, on Wednesday when he heard the camera being turned on, he definitely started striking poses. I think it’s another sign he’s feeling better. 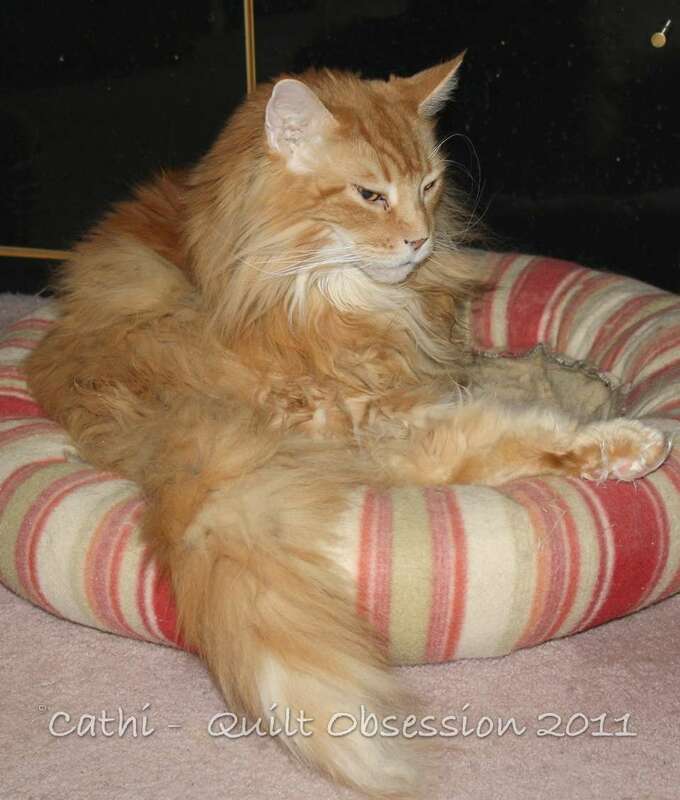 Lester was caught in a funny pose in the kitty bed. The main piecing, other than the pieces around the edges, is done. I’ve started adding the edge pieces along one side so know it won’t take long to finish adding them and then it will be complete. I have a piece of flannel that’s perfect for the backing and there’s batting on hand, so this won’t take long now to finish and have ready. The only thing I’ll be waiting for is what the baby’s name is once it’s born and I can add that to the label. 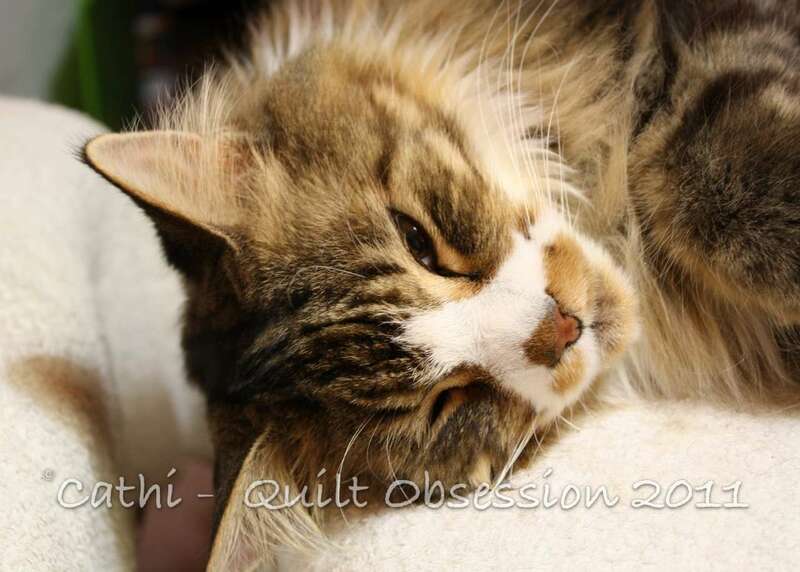 I’ve been contemplating what, if any, quilting goals I have for 2011. I am not making resolutions because I know I’d break them. But goals? Goals is another matter. I have a few. I’d like to try making a small quilt in solids. I’ve never worked with just solids and am not sure how much I’ll enjoy that, but I want to give it a try. My second goal, and probably the biggest one, is to try to limit myself to making small quilts when I start anything new this year. I have many UFOs that are going to be large quilts on the go as it is, all of which I want to spend time on, and hopefully complete, this year. Summer Picnic Dish, the Harpsichord quilt, my POTC blocks, the Pickled Ladies, the clamshell diamonds in Kaffe fabrics, the Christmas Feathered Star quilt (and probably some others I’ve forgotten at the moment) are quilts I want to finish sooner rather than later. I also know that when I get ideas, some of which are in the ideas book already, I want to be able to play with fabric. Playing with designs on the computer, while it is a good way to get an idea about how something might work, just doesn’t seem to be the best way for me. I want to see what it looks like in fabric. So small quilts is the answer. 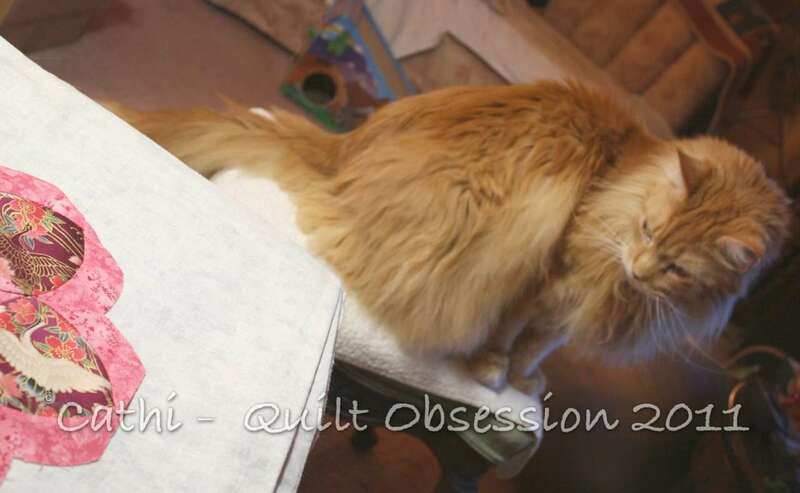 Then, if something I’ve made as a small quilt top really appeals, I can set it aside to make as a larger quilt. A third goal is to make sure I have one thing added to the Christmas box every month. 2010 taught me a very good lesson; that I can’t count on having all the time to do things for Christmas in the last 4 or 5 weeks of the year. Saturday was an incredibly mild day. We broke records and had temperatures in the 52 Fahrenheit range. It was lovely to think it was that mild on January 1. Only a dozen weeks or so and we’ll be starting to get spring weather. I’m already counting the days until we go back to Daylight Savings Time. 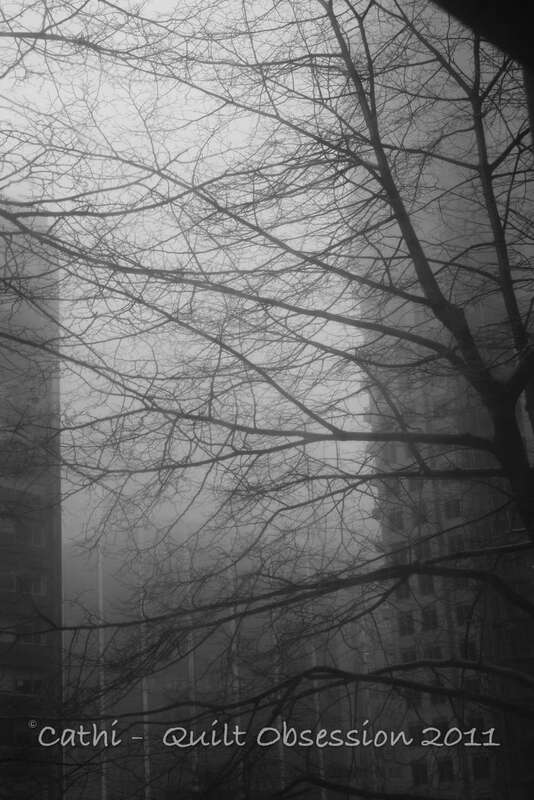 Along with the mild weather on Saturday, we had fog. 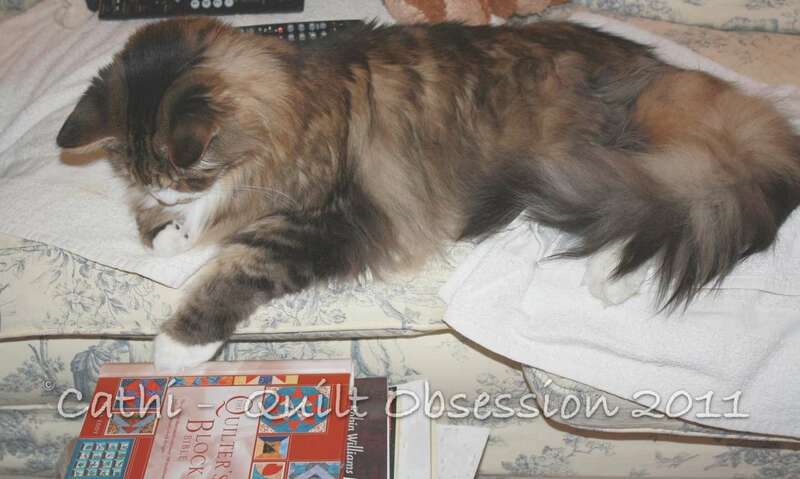 Smudge seemed to be looking at a quilt book as he reclined on the couch. Lester posed for the camera Sunday night. It’s growing but not quite as quickly as I was thinking it would. 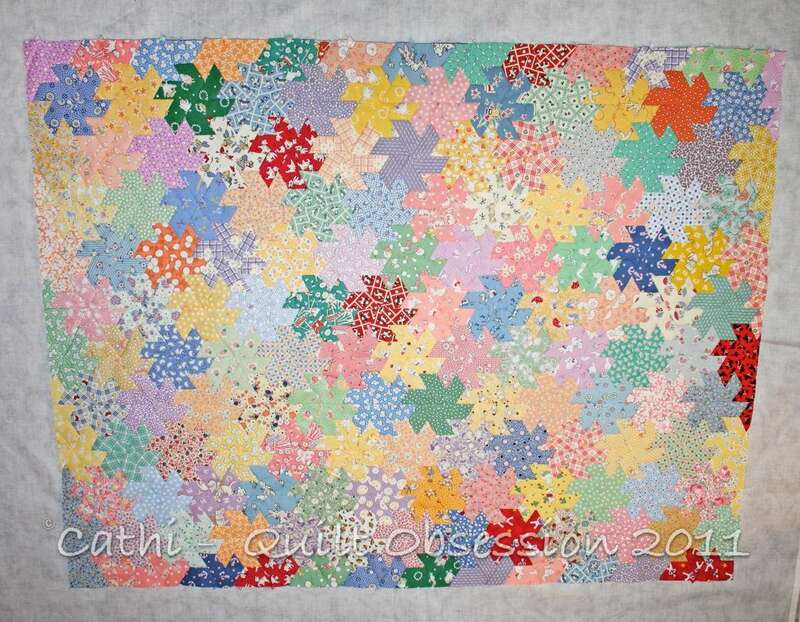 I’m still hoping to have the piecing finished by the time the weekend is over and, with any luck, have it ready to quilt by mid-week next week. I got distracted from stitching as we were watching the Tim Burton version of Alice in Wonderland last night. Normally, I watch/listen and stitch with no problems but that was so well done that there was much less stitching done than normal. Lester is quite interested in the syringe feeding and usually is right there supervising. 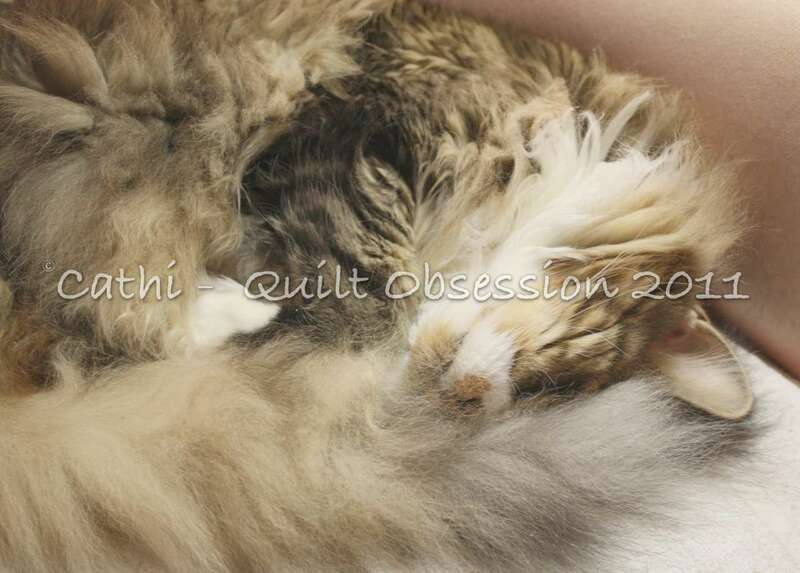 I had already made a quilt for my cousin’s new addition to the family due in February, but realized it’s really too large for a newborn and is more of a lap quilt size. 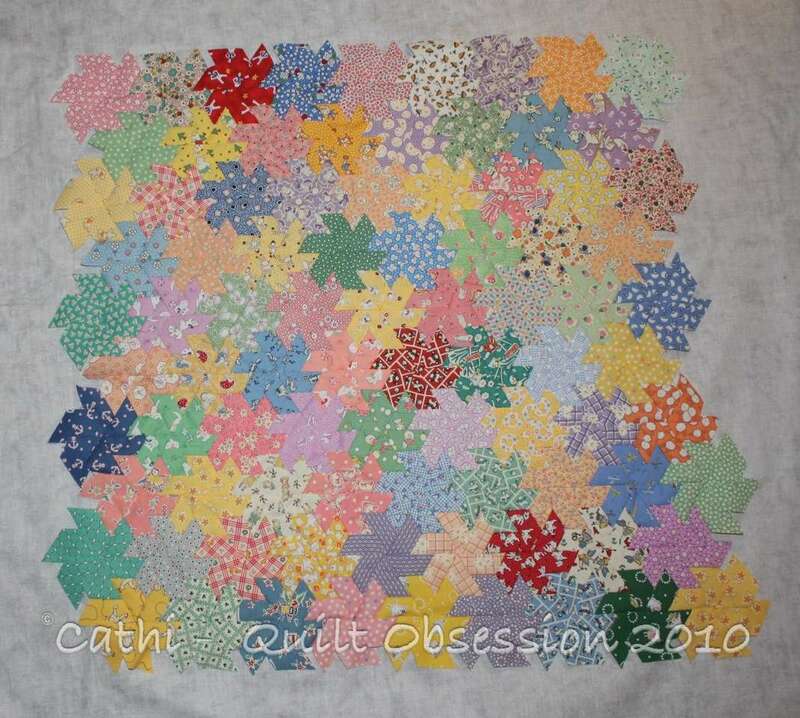 I was playing with some ideas for another baby quilt, when I remembered this was partially done. So on Boxing Day I got this out of the UFO pile and started adding to it. It’s quick to stitch, so I’m hoping to have the top finished by the end of the week other than the final setting pieces around the edges. I have lots of diamonds and triangles of the right size already printed on ’30s prints, so will be able to use them for the edge pieces. I’m very grateful I had started this and had put everything for it away together. It was nice to be able to just pull out the box and have everything in one spot. Within minutes of pulling the box out, I was stitching. As much as I enjoyed making the blocks, I think because I didn’t have a recipient for it in mind it lost some of its appeal. Now that I have a goal in mind, I’m excited about stitching it again. Smudge continues to improve. He’s starting to treat us to some of his crazy poses, like this one. Lester is being a bit more dignified.